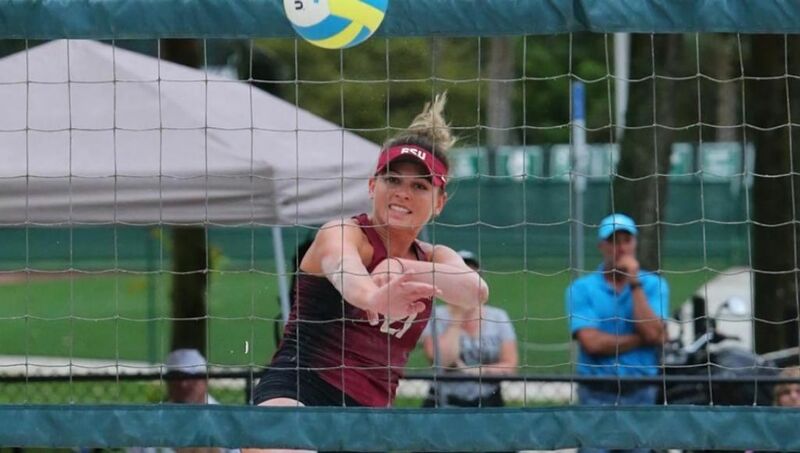 DeLAND, Fla. – The Florida State Beach Volleyball team suffered its first loss of the 2016 campaign falling to No. 5 Hawaii, 4-1, Saturday afternoon in the final day of the Stetson Beach Invitational. The loss snapped a 14-game win streak by the Seminoles (14-1) who finished the weekend tournament in DeLand with a 2-1 record as all three matches came against top 10 opponents. The win streak was the second longest in school history as the mark fell one win shy of the school record 15 straight wins set during the inaugural 2012 season. The Rainbow Wahine (8-5) put the pressure on the Noles early running out to a 2-0 lead following wins on courts four and five. Hannah Zalopany and Ari Homayun recorded Hawaii’s first point of the match with a straight set victory over Macy Jerger and Cecilie Woie, 29-27, 21-16, on court four. After dropping the first set (20-22) on court five, Hailey Luke and Nikki Esposito responded with a 23-21 victory in set two. The Seminoles could not ride that momentum into the third set as Mikayla Tucker and Ginger Long gave Hawaii a 2-0 advantage with a 15-10 victory in set three. Hawaii continued its winning ways into the second session with impressive straight set victories on courts two and three to secure its second straight win over the Noles. Clare-Marie Anderson and Katie Spieler defeated FSU’s Kristina Pellitteri and Victoria Paranagua, 21-13, 21-13, on court two to clinch the match, while Hannah Rooks and Ka’iwi Schucht downed Vanessa Freire and Sierra Sanchez, 21-19, 27-25, on court three. The loss for both Pellitteri/Paranagua and Freire/Sanchez marked the first setback by both duos this year. FSU’s lone point of the match came at the number one position as Julie Brown and Jace Pardon tripped up Lara Schreiber and Nikki Taylor in three sets, 21-17, 20-22, 15-9, to finish the weekend 3-0. Florida State’s fourth match of the Stetson Beach Invitational against No. 20 Florida Atlantic was canceled. The Seminoles return to action on Saturday, April 2 in Baton Rouge, La., as FSU will face No. 10 Grand Canyon (3 pm ET) and No. 12 LSU (6 pm ET). Match 15 – DeLand, Fla.